Augsburg College announced Friday that Center for Democracy and Citizenship, an organization with a reputation across the globe for innovative thinking about public engagement, will become affiliated with the College, effective July 1, 2009. 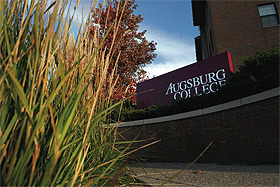 The Executive Committee of the Augsburg College Board of Regents approved the move this morning. Led by co-directors Harry Boyte and Nan Skelton, the Center for Democracy and Citizenship has been part of the University of Minnesota's Humphrey Institute of Public Affairs. The Center for Democracy and Citizenship's work is grounded in the belief that a healthy democracy requires everyone's participation, and that each of us has something to contribute. This work builds on a long tradition of people of all ages working together for the common good. For both sides, the move is about partnering with another organization that shares similar values. "Their network of relationships and the work they try to do in strengthening neighborhoods and broadening the work of citizenship is very much in line with our mission as an institution," Augsburg College President Paul C. Pribbenow said. "It is very much in line with our vision that we are called to serve our neighbor. Said Boyte, "What we like about Augsburg is the ground-level connection to neighborhoods and diverse cultures. Augsburg is rare in that it has a strong connection to place, in this case an urban setting and Cedar-Riverside. We're absolutely convinced this is the wave of the future and Augsburg is going to be a pioneer." The Center for Democracy and Citizenship will relocate from the U of M's West Bank to a spot in the Cedar-Riverside neighborhood near the Augsburg campus. Details continue to be finalized. -	Public Achievement is a youth civic organizing model that was developed by the Center for Democracy and Citizenship in 1990. It is used in schools and communities in several states and around the world in Turkey, South Africa, Northern Ireland, Israel and Gaza, and the West Bank. -	The Jane Addams School for Democracy brings immigrant families, college students, and other community members together to do public work and learning on St. Paul's West Side. It is a community-based initiative inspired by the vision of democracy, productive citizenship, and popular education held by settlement house pioneers like Jane Addams, who created Hull House in Chicago in 1889. -	The Warrior to Citizen Campaign challenges Minnesotans at the community level to support returning veterans and find ways to tap the new skills and experience they have to offer as citizens. "Public Achievement is now in 22 countries," Boyte said. "There is a lot of potential for connections with Augsburg and the people who are interested in global education." Augsburg is clearly a leader both locally and nationally in areas of civic engagement and service learning. Recently the College was selected by the Carnegie Foundation to receive the classification for Community Engagement. Augsburg was recognized for its curricular engagement and its outreach and partnerships. Augsburg is also one of about 80 colleges and universities nationally that sponsors the Bonner Scholar and Bonner Leader programs. From the moment students arrive at Augsburg, they experience student engagement in many ways. Some of it is through the curriculum. Some of it is through the Center for Service, Work, and Learning. And some of it is through the College's partnerships in Cedar-Riverside, Seward, and Phillips neighborhoods. Many of these partnerships provide opportunities for students to engage in hands-on service learning, internships, and work study. "I think it fits well mission-wise," Boyte said. "And it comes at a time when our work is full of growth and energy and new possibilities. We're quite pleased." Over the next year, the Center for Democracy and Citizenship will work with the dean of the College to formulate a strategy to integrate their work into the Augsburg curriculum. Boyte will continue to serve as a senior fellow at the Humphrey Institute. Augsburg will hire current staff members of The Center for Democracy and Citizenship. Nearly all of the group's operating budget, however, will come from outside funding sources. The College will provide staff resources to The Center for Democracy and Citizenship. "Our hope is that in working along side of them, they will bring their expertise in the Augsburg community and help our students, faculty, and staff in their projects," Pribbenow said. "It's going to be amazing. I'm particularly excited that they share our commitment to Cedar-Riverside and that they want to bring some of the good work that they're doing on the West Side of St. Paul to Cedar-Riverside."